Searching for information on carpet cleaning franchises or thinking about opening a carpet cleaning franchise? Consider Chem-Dry, Entrepreneur Magazine’s top-rated carpet cleaning business 26 years in a row. 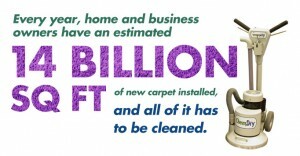 Chem-Dry is the world's largest carpet cleaning franchise for a reason. We've offered professional, environmentally safe service and cleaning from our founding in 1977 — using a hot carbonated water extraction cleaning method that removes dirt and stains from surfaces efficiently, with little water and rapid drying time. For entrepreneurs thinking about opening a carpet cleaning franchise, the benefits go beyond effective cleaning. At a time when small business loans are still hard to come by, you can buy a Chem-Dry franchise for as little as $6,000 down and secure in-house financing for the Franchisee fee — a rarity in the franchise industry and a real blessing for people with a drive to succeed but limited funds. Chem-Dry backs up its best-in-class products and services with unparalleled training and support that prepares new franchise owners not just on cleaning but on successful business ownership, with marketing and operations guidance from the best in the business. It’s impossible to find a better cleaning franchise opportunity. Chem-Dry franchise owners bear that out by staying with us for an average of 15 years (the franchise industry average is seven). Think you’re ready for a cleaning franchise business opportunity that’s one of the best values in franchising? We want to expand, especially east of the Mississippi and in Canada, and we want to hear from you. Just fill out the information form on our site and download the free franchise report that has details about our value proposition, earnings potential, people, history, products and more.